Solve the mystery of seven recent murders in Vivec. Hear latest rumors about Mysterious Killings. Talk to Elam Andas in the Office of the Watch. Return to Andas for your choice of rewards. Speak to people in Vivec about the latest rumors and you're bound to hear of the latest mysterious deaths, including two Ordinators. You will eventually be directed to Elam Andas in the Office of the Watch in Vivec's Hall of Justice, Temple Canton, for more information. The murders were strange in that although all the victims were armed, it appears that only one of the seven, a mage, had put up a fight, and nothing was removed from the bodies. Three victims were found in the Foreign Quarter, one in the water surrounding the Arena, one in the Hlaalu Compound, and the two guards near the Hlaalu victim (the last two are believed to be related). The fact that the two guards did not have their weapons drawn brings the concern that the murderer is incredibly powerful. Finally, although there are no witnesses, there is a report of someone being threatened by a Dunmer woman wearing a skirt and Netch armor, and wielding a dagger. Ask around about the murders and the woman in the Hlaalu Compound, Arena, and Foreign Quarter. From the Foreign Quarter you'll learn that a Dunmer woman was seen in the underworks of the canton. Still vague, but it is worth checking out. Enter the west side of the Underworks in the Foreign Quarter. The woman in question is indeed the culprit, which is basically confirmed when she attacks you on sight (she is a red-haired Dreamer Prophet). She is wielding a Dagoth Dagger, which rapidly drains its victim's fatigue, so beware. This explains why the two dead guards were unable to draw their swords after being surprised. Report back to Andas when she is dead to receive a choice of an Indoril Helm and Cuirass, or the Belt of the Armor of God, a belt that fortifies Willpower while casting Sanctuary and Shield spells. Remember—if you initiate conversation with an Ordinator or vice versa while wearing the helm or cuirass, it will permanently trigger all Ordinators to attack you on sight. If you are having trouble finding someone who will mention the attacks, Marcel Maurard in the lower waistworks of the Foreign Quarter talks about it, though so does almost anyone in Vivec if they don't have something more important to talk about. The Dreamer Prophet has a Crude Bronze Key that opens the cell in Mamaea, Sanctum of Black Hope where Hannat Zainsubani is held prisoner. Although Elam states that the Indoril Helm and Cuirass are Heavy Armor, they are in fact standard Indoril armor and are therefore Medium Armor. The Dreamer Prophet does not exist until you speak to Elam Andas. Not far from where you find the Dreamer, there is a dead Orc under the water, possibly her most recent victim. There are other corpses in some of the other cantons' underworks as well, some of which have been there for quite some time. It's unclear whether these are related or not. 1 Two Ordinators and five outlanders have been killed in Vivec, their throats slit. The rumor is that the Office of the Watch at the Hall of Justice is looking for outside help. 5 Two Ordinators and five outlanders have been killed in Vivec, their throats slit. The rumor is that the Office of the Watch at the Hall of Justice is very concerned, and is looking for special help. 10 Elam Andas, chief of Vivec's Order of the Watch, has asked me to find and execute a killer who has slit the throats of five outlanders and two Ordinators. 15 Two outlander victims were found in Foreign Quarters corridors, one on Foreign Quarter Canalside, one in a Hlaalu Compound corridor, and one in the water near the Arena. All were armed. Only one, a mage, appears to have put up a fight. All had their throats slit with a dagger. The two Ordinators with their throats slit were found near the victim at Hlaalu Compound. It may be someone very stealthy or a very powerful sorcerer. 20 There are no witnesses to any of the killings. But in Hlaalu compound, at about the same time as one of the killings, an outlander reported being threatened by Dunmer woman armed with a dagger. 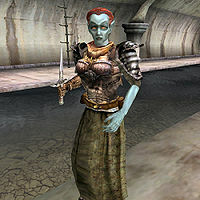 It was dark, but the outlander was sure the Dunmer woman with a dagger was dressed in a skirt and netch leather armor. 25 In the Foreign Quarter I was told that someone has seen a Dunmer woman down in the Underworks. That's odd, since Dunmer are not seen often in the Foreign Quarter, and there's nothing in the Underworks but rats and sewers. 50 Finishes quest I reported to Elam Andas, and he said the Dunmer woman I killed in the Foreign Quarter Underworks matched the description of the killer he wanted executed. As a reward, he offered me a choice between an Indoril helm and cuirass or a Belt of the Armor of God. I accepted the Indoril helm and cuirass. I am not supposed to wear it in Vivec City, to avoid being mistaken for an Ordinator. 55 Finishes quest I reported to Elam Andas, and he said the Dunmer woman I killed in the Foreign Quarter Underworks matched the description of the killer he wanted executed. As a reward, he offered me a choice between an Indoril helm and cuirass or a Belt of the Armor of God. I accepted the Belt of the Armor of God. This page was last modified on 12 August 2018, at 08:58.